Well, I did it. I took the plunge and upgraded to the Office 2013 Preview. So far, I’m pretty happy. It took me some time to get used to the bright white interface, but everything feels shiny and new now that my eyes have adjusted. I’ve had a few hours to play with it, and I wanted to offer my first impressions. As noted previously, the first thing you’ll notice when you open any of the new applications is the white-on-white design. The lack of contrast is really distracting at first, and I’m not sure if this is a feature of the preview or if this is how it will look in the final product. Microsoft has introduced some themes that allow you to add a small embellishment to the ribbon area, but the themes don’t affect window color at all. I’m not that into any of the themes, but here’s a post that gives you a quick look at what’s available, if you’re curious. The applications all have the same look & feel, but there were a few new suite-wide features. One of my favorites was the animated cursor. This was interesting to me, and modifying the cursor behavior is not something that ever would’ve occurred to me. It’s neat, though. When you type, the cursor slides to the right. When you hit enter, it slides down to the next line. It’s weird, but it makes typing in Word and Outlook feel like an enhanced experience. 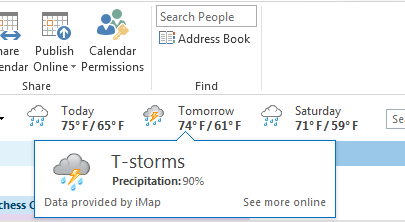 The next significant feature I came across was the weather in Outlook. You read that right: the weather. I was looking at my calendar and noticed temperatures and a graphical forecast. It’s hard to say how useful this will be since I’m not used to having access to weather in my calendar, but I’m excited about it! There’s a fade-and-slide-in effect that occurs when switching between areas in Outlook (Mail, Calendar, etc.) that feels slick, but I haven’t noticed much else that’s changed aside from the appearance. With both Word and Excel, I was most excited about the new document templates. In both applications, the templates presented allow you to create legitimately good-looking and functional documents. 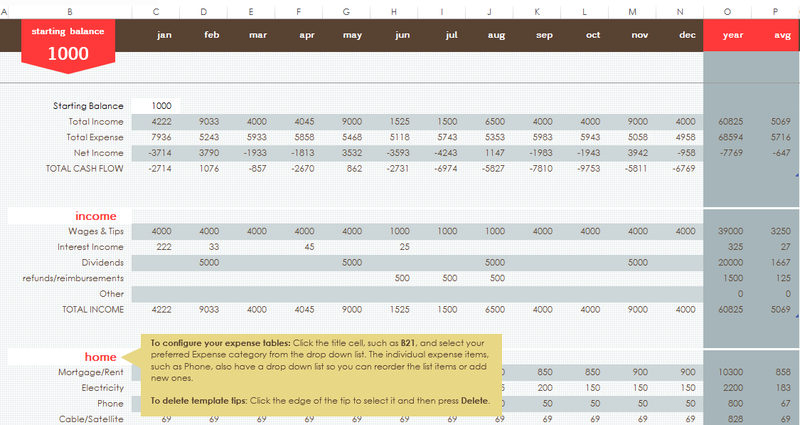 The screenshot below shows the “family budget” Excel template, which includes a worksheet for setting up categories, a worksheet for tracking income and expenses in the categories, and a dashboard worksheet that includes summary data complete with charts and graphs! This is way better than the budget spreadsheet I whipped up a few years ago. What’s also great about the templates is that they walk you through how to use them effectively. For example, there’s a “student report” template in Word that has in-line instructions for adding graphics, adding a table of contents, and adding a bibliography. How cool is that?! 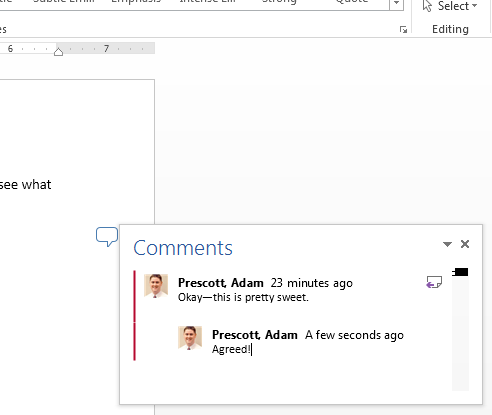 Another much-improved feature in Word is the comments. Comments now flow like a conversation. You can see who made what comments, and you can reply. Replies show as nested responses, so it’s easy to follow what’s been happening. This will be very helpful when passing documents back and forth for review. OneNote has been arguably my favorite Office app since I started using it in 2007, and I’m happy to report that the improvements to OneNote in 2013 seem great. The first thing that happens when you open it for the first time is you’re asked to connect to SkyDrive. Sync everything to the cloud and make it available everywhere automatically? Yes, please! The colored tabs look nicer, and they actually work well with the new very-very white theme. Some screen real estate has been freed up by moving the notebook tabs on the left part of the screen to a drop-down next to the section tabs beneath the ribbon. Everything feels a little more polished except the cursor when you type; it doesn’t slide along like in Word and Outlook. That made me a little sad, but maybe they’ll get it into the final version. OneNote does have some other cool features, though. I’m not sure if this was in the previous versions or not, but I was pretty impressed with the “Ink to Text” and “Ink to Math” features. 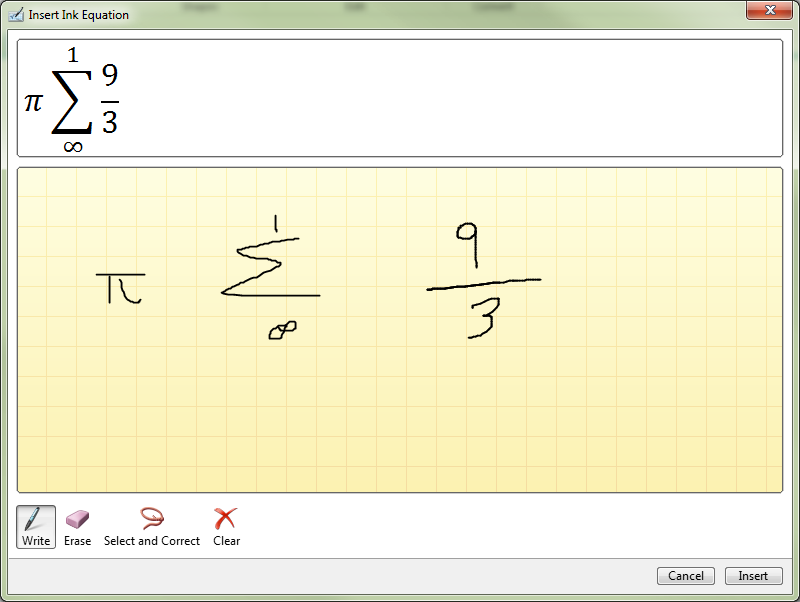 These are what they sound like: draw some text or math with the mouse/stylus/etc., and OneNote converts it to what you meant. Very cool. The only disappointment I’ve had with the new Office is that integration with Lync is broken. To be fair, I’m using an unsupported configuration (Lync 2010 client connected to OCS 2007 server), but it’s still unfortunate. My IM conversations are still recorded, but I’ve lost contact status in emails and meetings. I’m sure this will all be fine once we upgrade to Lync. Overall, I’m pretty excited about the new version of Office. I’m looking forward to using it over the next few months and exploring the new features. Are there cool features that you’ve discovered with this new version of Office? Please share–I’d love to hear!